Golf Buddy LR5 Laser Rangefinder (No Annual Fee) Guaranteed by XMAS! - See Price in shopping cart - GolfersEdgeOnline.com - Best Golf Equipment On The Web! Golf Buddy LR5 Laser Rangefinder (No Annual Fee) Guaranteed by XMAS! The LR 5 Laser Rangefinder from Golf Buddy is small and easy to use to get the most information you can for better golf. Three different scan modes give you readings to any target with accuracy to within one yard. The LCD display is easy to read and six times magnification allows you to see you target easily. Be The First Person To Write A Review For The Golf Buddy LR5 Laser Rangefinder (No Annual Fee) Guaranteed by XMAS! 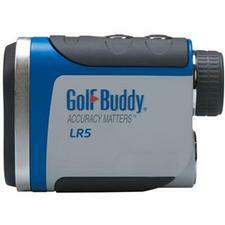 Contact Us About The Golf Buddy LR5 Laser Rangefinder (No Annual Fee) Guaranteed by XMAS! If you have any more questions about the Golf Buddy LR5 Laser Rangefinder (No Annual Fee) Guaranteed by XMAS! ; do not see the model you are looking for; need custom options; or prefer to not purchase online, then please call us at (630) 656-1291.